Check out the video of the drawing HERE! Watch the Bike Raffle Winner reaction to his bike HERE! 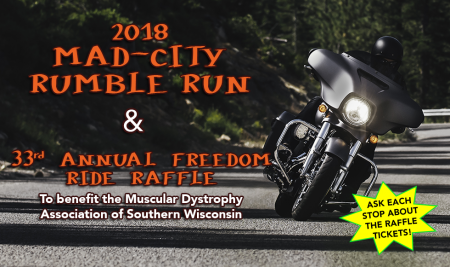 Join us for the drawing of both the Freedom Ride Raffle & the Rumble Run Booklets at 11AM on Friday, October 12th. Collect all of the stamps in your booklet to be entered to a win a cash prize. Books to be turned in by the end of the business day on SUNDAY, SEPTEMBER 30, 2018. Final ticket stubs to be turned in by the end of the business day on MONDAY, OCTOBER 1, 2018.